When looking for traditional fireplace mantels in Orange County, you may want to know a few things before making your selection so that you can choose the best mantel to fit in with the style you are looking for. The traditional fireplace mantel remains the most popular style. The shape of the mantel is typically squared, with the mantel area extending beyond the surround that is visible at the sides surrounding your fireplace. The mantel is wide enough for you display objects of value or seasonal decorations. 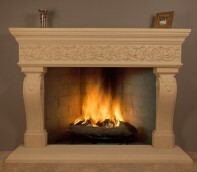 Marble and cast stone are popular materials used in traditional fireplace mantels. Although many color choices are available, neutral tones of cream or white are typically selected. Designs that are carved into the traditional style of mantel can be straight or curved in a variety of styles. However, any designs will be minimalistic to provide an understated appearance. A traditional fireplace mantel works well in both residential and commercial settings. Styles that work best with traditional mantels include classic looks, rustic styles, and other styles that range from comfortable to professional. When you prefer that your fireplace fit in well with your existing décor, a traditional mantel will work well to suit your needs. SoCal has a large selection of Orange County fireplace mantels to suit your unique taste preferences, including traditional fireplace mantels. You can choose from options available in the showroom or you may prefer a custom solution for your home or office.